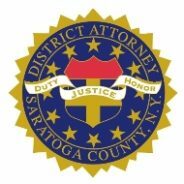 Saratoga County District Attorney Karen A. Heggen announced that Joseph P. Rossi (DOB: 10/30/97), of 38 Maplewood Drive, Charlton, NY pleaded guilty on June 19, 2018 in Saratoga County Court to Attempting to Make a Terrorist Threat, before Saratoga County Court Judge James A. Murphy, III. Joseph P. Rossi pleaded guilty and admitted in Court that on April 8, 2018 he attempted to intimidate a civilian population by posting an on-line video where he threatened to commit the specified offense of Murder in the Second Degree, a Class A felony, at a Burnt Hills/Ballston Lake School and that he thereby caused a reasonable expectation or fear of the imminent commission of such offense. The District Attorney’s Office has been in regular contact with officials from the Burnt Hills/Ballston Lake School District throughout the proceedings. Assistant District Attorney Charles Bucca prosecuted the case and deferred comment until sentencing, which is currently scheduled for August 8, 2018, at which time Rossi is expected to be sentenced to 5 years’ probation with mental health and substance abuse terms and a permanent order of protection which will prohibit visiting school properties or contacting employees or students.